Imagine a creature with a long, stem-shaped body and leaf-like projections on either side. It is attached to the ocean floor and sways gently in the ocean current. This creature most closely resembles a feathery soft coral, but it’s not. In fact, it is not anything you can see in the modern ocean. It is about 600 million years old and lived during a period called the Ediacaran. This organism is called Charnia, and it’s amongst a group of organisms that scientists have been puzzling over for decades: Are they animals, lichens or something else entirely? “For paleontologists, there is no easy solution,” said Mark McMenamin, a paleobiologist at Mount Holyoke College in South Hadley, Mass. “I don’t know anyone who’s made up their mind about what they all are.” But trying to find the solution is important. Fossils with clear animal characteristics introduce an enticing question: If some Ediacarans are primitive animals, could animals be older than we previously thought? Before now, the Cambrian fossils have been considered the oldest complex animals at about 540 million years old, but the classification of some of the Ediacaran as animals could push back the oldest animals on record about a hundred million years, which could mean that animal evolution began much earlier than we previously thought. During the Ediacaran, the ocean was a very different place than what we can see today, snorkeling around in places like the Gulf of Mexico. A dense mat of microbes covered the entire ocean floor. There were no coral reefs and swimming fish. Instead Charnia stalks swayed with the ocean current, an early animal called a Kimbrellas shuffled along the ocean floor and round little discoid creatures, Dickinsonia and Yorgia, peppered the floor in clumps. The Ediacaran is dated between 635 and 540 million years ago. It preceded the Cambrian period, about 540 to 485 million years ago, which marked the beginning of one of the biggest explosions of life in the history of Earth. For a long time, scientists thought the Cambrian period was when multicellular life first ran rampant. It is when most of the known kinds of animals that scientists recognize today first appeared on the scene. Yet late in the 20th century, researchers discovered fossil evidence of multicellular organisms in the Ediacaran as well, pushing back their first appearance almost 100 million years. Unlike the creatures of the Cambrian, whose descendants still walk the land and swim the seas, not all Ediacaran species resemble life forms found on the planet today. These organisms have long puzzled scientists because they can be interpreted in so many different ways. Where one scientist sees an ancient sponge, another scientist might see a very primitive animal form, and another scientist might see an algae. Marc Laflamme, a paleobiologist from the University of Toronto in Canada, said that the classification of these fossils has been constantly evolving and is always controversial. “For the most part, early work considered [these fossils] animals in one way shape or form,” he said; however, they were very primitive animals like jellyfish and sponges. Laflamme added that some researchers thought they might not be animals at all, but another type of organism entirely, called Vendobionta. Some Ediacaran fossils appear somewhat similar to modern organisms. For example, Charnia resembles the modern sea pen, a feathery soft coral. But only a few of these ancient fossils clearly resemble something in today’s ocean. Kimbrella, a ridged, teardrop-shaped fossil, doesn’t resemble anything living today. However, most scientists interpret it as having a strong bilateral symmetry — divisible into two symmetrical halves — which is a characteristic that all animals are noted to possess. Another fossil, Yorgia — a round, ridged fossil — is also seen as having strong bilateral symmetry, and some scientists think it also has a small head. One reason that these fossils are so difficult to classify is that it’s not clear how well they were preserved. “The main question regarding the Ediacaran fossils is whether they represent whole bodies of organisms or just their parts most resistant to decay,” said Jerzy Dzik, paleobiologist at the Polish Academy of Science’s Paleobiology Institute in Warsaw, Poland. Dzik said that some of the fossils, most notably some of the Dickinsonia fossils — which left ridged, circular imprints — do show impressions of internal organs, but not all of them do. Ediacaran fossils are most often preserved in sandstone, which is atypical. Usually, fossils of soft-bodied organisms are best preserved in shale,which provides much better preservation. However, the sandstone from the Ediacaran seems to have undergone lithification — a transformation into natural cement — that allowed the sandstone to preserve life in a way that it isn’t normally able to do. In addition to the question of preservation, there is some debate about the origins of the sediment in the sandstone — particularly the beds found in southern Australia. The sandstone beds show an unusual red coloring that Gregory Retallack, paleobiologist at the University of Oregon in Eugene, indicated might be terrestrial rather than marine. “Iron minerals rust as they are weathered into red pigmenting minerals,” he said. “In marine sediments, oxygen is limited, so iron remains gray-green.” It is for this reason that Retallack believes that Dickinsonia might have been lichen rather than an animal. However, Retallack is apparently the only one who believes this theory at present. McMenamin said that Rettallack’s conclusion that the sandstone formed from terrestrial sediment doesn’t fit with the high oxygen levels in the ocean at the time, which might have also created red coloring. 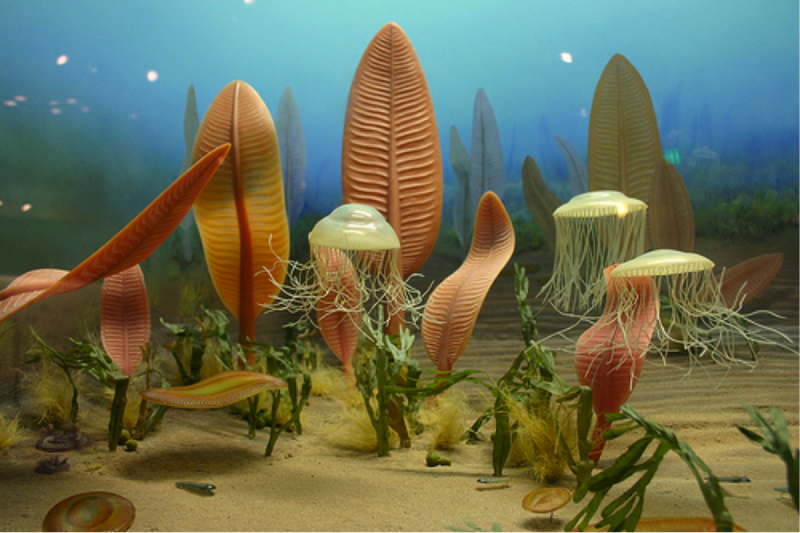 The paleobiology community now believes that Ediacaran organisms are a mixture of animals and Vendobionta. The real problem is deciding how to classify which is which. In a recent paper in Gondwana Research, an international geology journal, Laflamme proposed that one way to classify these organisms is by grouping them into smaller categories. ­­“The community needs to stop viewing them as one entity,” he said. In the past, researchers have lumped the Ediacaran biota together, which Laflamme explained is an ineffective way to study them if they are only distantly related to one another. Scientists are slowly unraveling the secrets of Ediacaran organisms, and once they do, we may finally know how some of these creatures once lived. “I don’t think that it is a clade — group — of organisms that we would call the Ediacarans,” said Knoll. Instead he suggests that Ediacaran fossils should be viewed as a window into the past. The more we investigate the evidence left from the window the more we might know about all of these different organisms. Perhaps one day we might know more about how Charnia actually spent its days — as a primitive animal or an extinct Vendobionta.